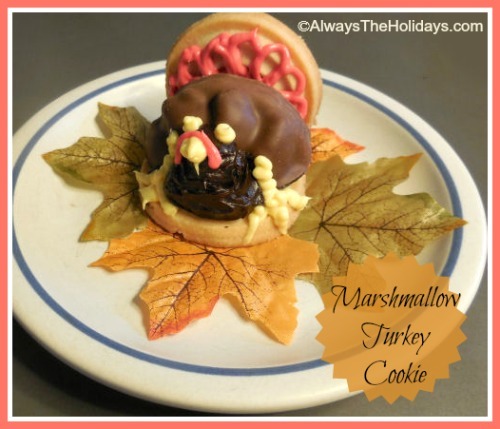 If you love to decorate cookies, this recipe for Marshmallow Turkey cookies is for you. They are as much fun to make as they are to eat. The cookies are made with a store bought chocolate marshmallow cookie, some short breads, frosting and a steady hand! Cut a small piece off the end of a shortbread cookie with a serrated knife. 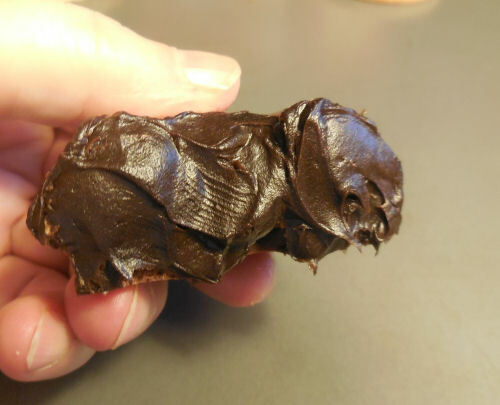 Using a sharp knife, cut your marshmallow cookie in half and spread the bottom of it with chocolate frosting. Position it towards the back of the shortbread. (the other half will make another turkey. 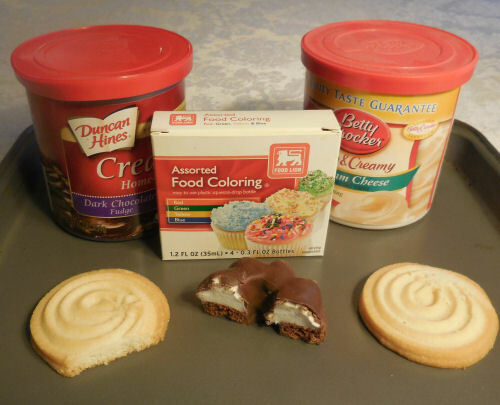 Add some chocolate frosting to a piping bag and pipe some frosting at the front of the chocolate cookie for a body and chest. Put buttercream frosting into two bowls. Color one red and the other yellow. 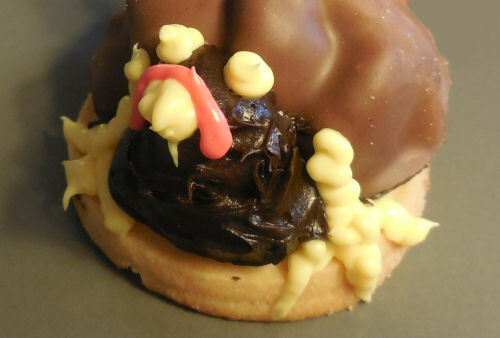 Pipe on eyes, a beak, and a turkey crop on the chocolate cook. 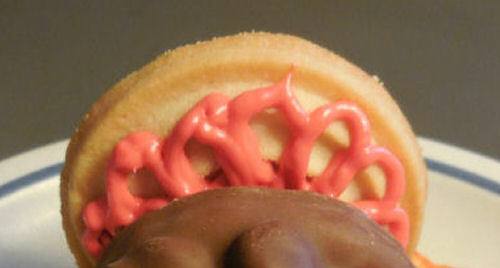 Pipe red tail feathers on the sugar cookie that was cut off. Add chocolate frosting behind the turkey body and attach the tail feathers. 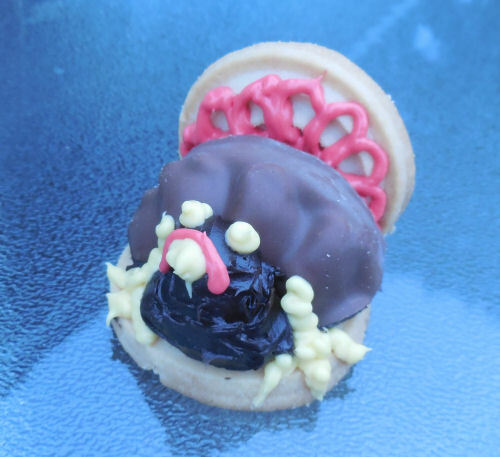 The only problem with these marshmallow turkey cookies is keeping the kids from digging in before it's time for dessert. 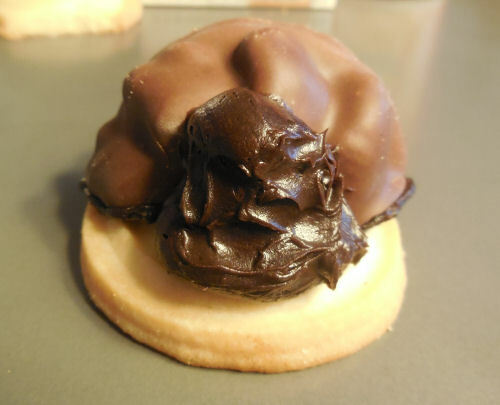 Using a sharp knife, cut your marshmallow cookie in half and spread the bottom of it with chocolate frosting. Position it towards the back of the shortbread.